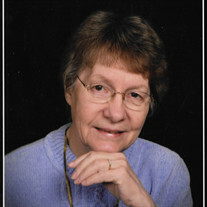 Marilyn Louise Bindemann, 77, of Hannibal, Mo. passed away at 10:22 p.m. Saturday, August 20, 2016 at her home. Funeral services will be held 11:00 a.m. Thursday, August 25, 2016, at Park United Methodist Church in Hannibal. Pastor Bob Seaman will officiate. Burial will be in the Grand View Burial Park. Visitation will be held 9:00 to 11:00 a.m. Thursday at the church. The family is being served by the Smith Funeral Home & Chapel, in Hannibal. Marilyn was born on October 3, 1938, in Allegan, Mich. the daughter of J. Frank and Ona (Baker) Terry. Marilyn was united in marriage to Charles Bindemann on January 15, 1960, in Allegan Mich. at the First United Methodist Church by the Rev. Cermak. Survivors include her husband, Charles Bindemann of the home; one son, Dr. Alan Charles Bindemann and wife Major Stephanie, USAF, retired of Springboro, OH; one daughter, Diana Sue Malin and husband Charles David of The Woodlands, TX; four grandchildren, Alex David Bindemann, Mason Charles Bindemann, Sarah Marjorie Malin Young and Husband Taylor, and Hannah Terry Malin; one brother, Gordon Terry of Allegan, Mich; and several nieces and nephews. In addition to her parents, Marilyn was preceded in death by her parents, grandmother, Mina Tracy "MeMa", one granddaughter Rachel Elizabeth Bindemann, one brother, Robert Terry and two sisters-in-law, Lottie Terry and Judy Terry. Marilyn graduated from Allegan High School in the class of 1956. She went on to further her education at Davenport Institute in Grand Rapids, Mich. Marilyn and her husband were founders of Accu-Therm, Inc., where she held the position of CFO. Marilyn was a lifelong Methodist, most recently she is a member of Park United Methodist Church. Marilyn also attended Florida United Methodist Church where her husband serves as a lay minister. Throughout her life Marilyn was very involved with the United Methodist Church. Her participation included United Methodist Women, teaching Sunday School, camp counselor and other church activities. Marilyn was a former member of the Chapter JH P.E.O. She also enjoyed serving as a den mother for Cub Scouts and volunteered with Girl Scouts when her children were younger. She later enjoyed going to local schools and reading to the children. Marilyn enjoyed sailing at Mark Twain Lake with her husband. She also enjoyed sewing, reading, gardening and cooking. She was notably known for her cabbage balls, pigs in a blanket, butterscotch pies and "frozen dessert" fudge nut freeze. Marilyn also enjoyed going to her grandchildren's concerts. Pallbearers will be Arnold Sharp, David Erskine, George Lewenczuk, Don LaFuse, Norman Olson, and Mike Treaster. Memorial contributions may be made to the James E. Cary Cancer Center, The Heifer Project, Park United Methodist Church or Florida United Methodist Church.